The Mosquito was invented by Howard Stapleton, a British man who one day in his childhood became fascinated at his fathers’ warehouse when he was unable to tolerate high pitched sounds from welding equipment. At the same time that the sound was unbearable to him, the welders seem to not notice anything… perhaps this is what set the wheels in motion for the invention of The Mosquito. Mr. Stapleton invented The Mosquito anti-teen repellent out of a need to keep loitering teenagers away from storefronts. It operates by emitting high-frequency tone(s) that are outside the normal hearing range of adults. While not EVERY adult is affected by this condition, most of us are to a varying degree. This condition itself is called presbycusis, it’s a very common condition and will begin to manifest itself sometime after the age of 24. After testing the concept on his own children, Mr. Stapleton eventually formed a company called Compound Security and invented the Mosquito teenager repellent. 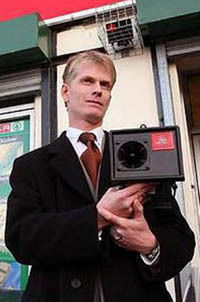 The device was unveiled for a trial run in 2005. The testing occurred in the town of Barry, South Wales. After being a huge success at driving away loitering teenagers, he began to mass market the device. There remains a lot of controversy over the Mosquito due to the fact that it “discriminates” against one age group, teenagers. Many children’s rights groups have protested against its’ use, some of them have even been successful in getting The Mosquito banned. It didn’t take a rocket scientist to figure out that teenagers could somehow use this to their advantage as a way of showing their defiance towards adults and society, not that anybody could really blame them for it. Some ingenious teenagers figured out they could simply create the same tones on their computer and then transfer the audio files to their cell phones to be used to notify them of incoming phone calls and text messages. The “Mosquito” Ringtone, the adult proof ringtone was born.